I seem to have finally hit my stride! Another project done and another cast on.. and they are even for family members. 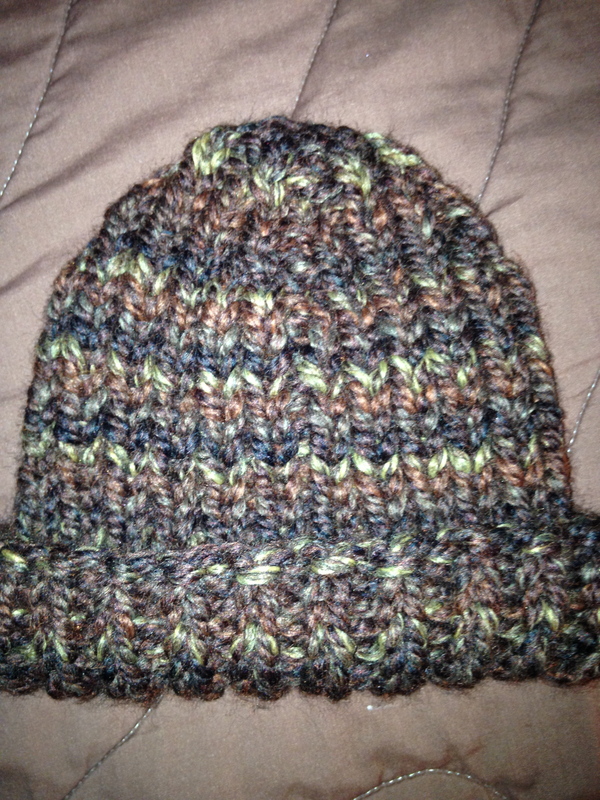 The hat is a simple 1×1 rib watch cap with a three-needle bind off after a few decrease rows. I love the colorway since it is a manly brown, but with enough variation to create interest… for me to knit. I cast on a 2×2 rib cowl with the remainder of this yarn to either go to the same recipient or another. Either way, I felt like today was a win. Only 25 presents to go! What’s your crazy? This question is starting to pop up everywhere in the knitting community, all spawning from a KAL (Knit-along) put on by The Fat Squirrel Speaks and the Stockinette Zombies podcasts. Some people are responding by casting on every project in sight, others are trying their hand at monogamous knitting. Though I clearly have a few crafting crazies at the moment (including a project that is slowly turning into a decoration doom), my current crazy is continuing to add more projects to my plate for the holidays. Beyond that, I’m even turning one project idea into something more complicated: cowls are becoming shawls, a simple hat is becoming a hat, mitten and scarf set…. I just cannot seem to stop planning more and more projects. It would be one thing if I was at least working in the logical order of completing my immediate family’s presents first… but no. My daughter’s teacher’s present is done though. So are a couple gifts for my coworkers. Most of my works-in-progress are for my family, and a couple are close to completion… of course I’m not working on them now. These will probably be the gifts keeping me up all Christmas Eve to sew on the last button and weave in all the ends… maybe even knit the last remaining stitches. Though I know I have a list prioritizing all of the projects left to knit… clearly I need to actually read the list… or hire someone to beat me over the head before I start another project that is not for my family. Both are valid ideas. Finally, some progress! Truth be told: I just had to put aside the crochet hook for a moment. Though I have grand ideas for the door decoration and crocheting is technically faster than knitting…. that’s only the case if you can crochet as long as you can knit. Clearly, I cannot.. I have not completely given up on the door decoration, it just might not be ready by Thanksgiving. 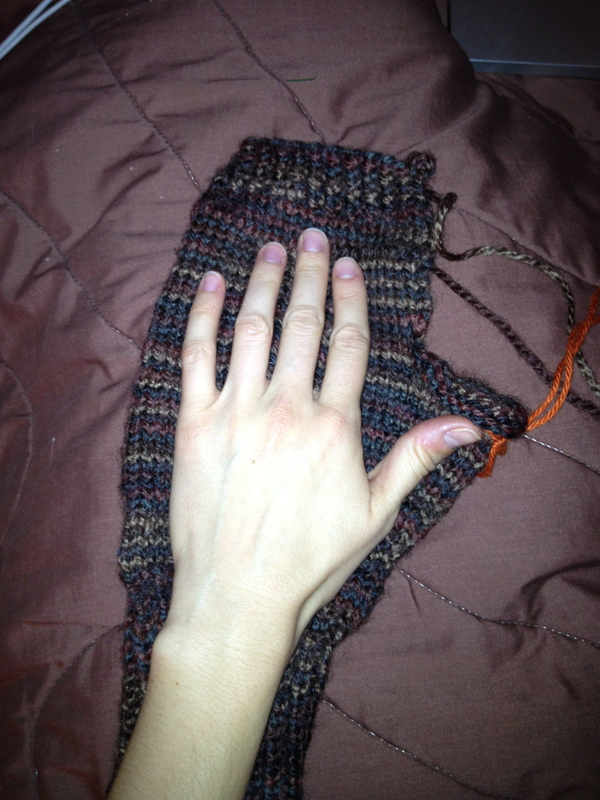 However, while the project was in time-out today, I completed yet another cowl and cast on the first of five hats. Of course, as soon as the cowl was off the needles, I found it missing. 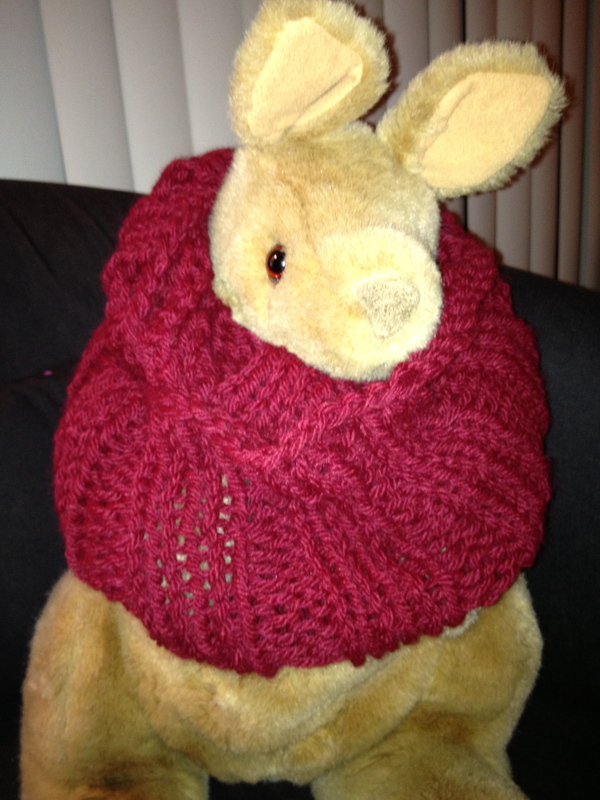 After putting M to bed, I found she had taken the time to pose one of her stuffed animals in the cowl – all ready for the finished project photos! The holiday season not only comes with the expected gifts for your own loved ones…. but other’s as well. I could go the entire rest of the year without any commissioned knits. As soon as November hits, everywhere I turn, people are asking if I can knit them something to give as a Christmas gift. Some of these requests are very doable and the people asking for them usually have an appreciation for knitting. These are the commissions I accept and get excited about, since I know that at least the person paying for this item appreciates the work that goes into it. Then there are the people who ask for something intricate, but after talking to them for a few minutes, they realize how unattainable it would be and settle for something more reasonable. But, there are those people out there who ask for extremely time consuming items and expect me to be able to finish them in under a month and for less than $50. When I tell them that the yarn alone would cost more than that… they look at me like I am the crazy one. Luckily, this year I have mainly received these impossible requests, making it very easy to turn down. To add to my personal present goals, I will only be completing two commission knits (so far), both of which are very exciting and should be easy to complete in a reasonable amount of time… I’m just hunting down the right yarn. Which never takes too long, right?